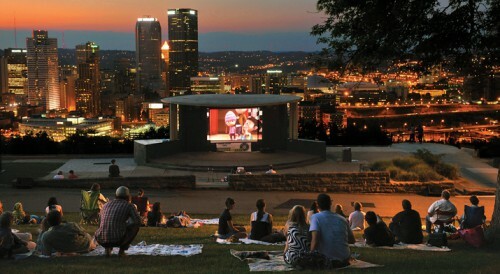 The Dollar Bank Cinema in the Park series resumes for the 2013 season this Saturday, June 8 at dusk. The free event, hosted at various local city parks, invites movie-goers to lay back, relax, and enjoy weekly movie screenings. The series features both kid-friendly G- and PG-rated flicks, such as Finding Nemo and Dr. Seuss’ The Lorax, as well as popular PG-13 films like The Dark Knight Rises, The Hobbit, and The Hunger Games. Guests are asked not to bring alcoholic beverages, but snacks, drinks, and chairs and blankets are encouraged. Flagstaff Hill also has a Wednesday night concert series before the movie starts with musical performances from 7-8 p.m.
Inclement weather may cause cancellations, so visit the Cinema in the Park website or call 412-422-6426 for more information. Check out the movie listings below or click on the map for a list of film dates and locations. 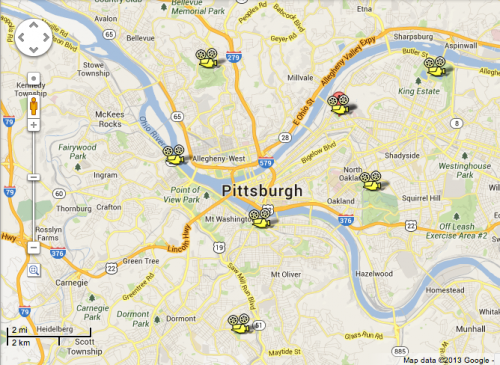 Click for an Interactive map of Pittsburgh Cinema in the Park movie dates and locations. Come early to enjoy mid-week musical performances.